Chocolate covered strawberries are one of the tastiest treats that you can make with fresh strawberries, but this chocolate and strawberry combination can be used in other types of desserts, as well. This Double Chocolate Strawberry Tart is definitely inspired by the idea of a chocolate covered strawberry – though in this dessert, the strawberries are on top of the chocolate! The tart starts with a Chocolate Shortbread Tart Crust. This buttery crust is filled with a very simple chocolate cream cheese filling. I love this filling because it is very easy to prepare and has a subtle cheesecake flavor to it that goes well with all kinds of other flavors, including fresh fruit. Melted dark chocolate gives it a good chocolate flavor while still keeping it light and not as heavy as a ganache filling can be. The tart is finished with a flower-like array of thinly sliced, fresh strawberries. You get a perfect mouthful of crisp crust, creamy filling, chocolate and berries in every bite. I made this dessert as 4 individual tarts for single servings (or sharing), but you can use the shortbread crust recipe to make a 9 or 10-inch tart shell, as well, and you can assemble these ingredients into one larger tart to serve a crowd. The tart is best when served just after you add the berries, as the fresh berries give off too much juice to store the entire tart for a long period of time. You can, however, prepare the tart shells a day or two in advance and store them in an airtight container at room temperature. The day you are ready to serve them, fill the shells with the chocolate cream filling and store the filled crusts in the refrigerator for up to a few hours. Add the strawberries just before serving. I like this tart served very simply, but to dress it up you can add a dollop of whipped cream to each one. You can also melt some apricot jelly and use it to “glaze” the strawberries for a super-shiny finish, though I think that perfectly ripe strawberries need no embellishment. In a large mixing bowl, whip together cream cheese and marshmallow fluff until smooth and well-combined. Blend in the melted and cooled dark chocolate, followed by the vanilla extract, and mix until the filling is a uniform color. Trim the strawberries and thinly slice. 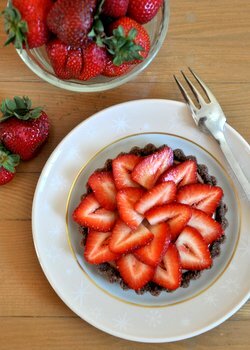 Fill tart shells with chocolate cream, dividing it evenly between the shells, and top with a layer of fresh strawberries. Tarts should be served shortly after adding sliced berries. 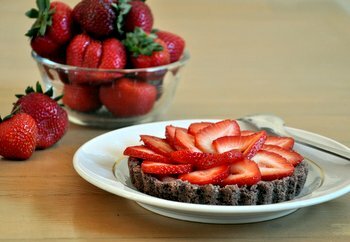 If you wish to prepare the tarts in advance, fill the shells with the chocolate cream and refrigerate for several hours, adding the berries just before serving. In the bowl of a food processor, combine flour, cocoa powder, sugar and salt. Pulse to combine. Cut butter into several pieces and add to flour mixture. Pulse until mixture is sandy and butter is well-incorporated. Pour crumb mixture into 4 individual four to five inch tart pans. Press firmly up the sides and into an even layer on the bottom of the pan. For a baked crust, bake at 350F for 15-20 minutes, until firm. Allow to cool completely before using. 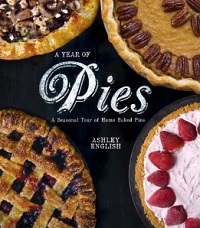 Makes 4 individual four to five inch tarts. 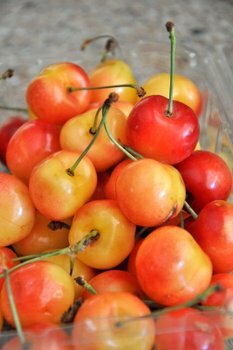 Previous PostPrevious What are Rainier Cherries? Looks absolutely delicious! I love strawberries and this looks so refreshing.